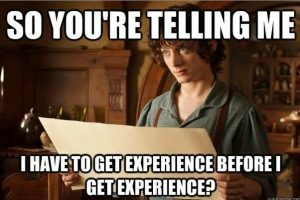 Updated for 2018: Yes, Internships! It’s the time of year when internships opportunities for the fall semester start cropping up again: paid, unpaid, in the community, around campus, and even right here in the English department. Should you apply for internships? YES: Professional experience while you’re still in college can help in three ways: (1) building your skills, (2) helping you explore your career options, and (3) giving you evidence to present to employers of your value. BUT: Much depends on what your goals are and what the internship offers. An internship isn’t a magic key that unlocks the door of full-time post-college employment. It’s one of many ways to get professional experience. 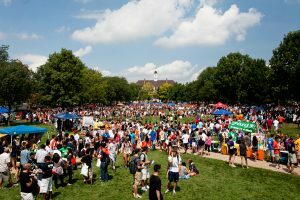 University of Illinois Quad Day. Yes, I’m talking to you: incoming freshmen and transfers. You’re getting bombarded with information from all sides, and it’s hard to take it all in. Getting a job after graduation feels a LONG way off, and if you have any brain cells available to devote to thinking about your future career, they are probably firing randomly. The good news: you don’t need to figure anything out right now. The bad news? It’s not actually all that bad. It’s just this: “figuring anything out” in the future will be easier if you do stuff now. That’s really all you need to know for now: do stuff. What kind of stuff? That depends. If you need to work in college, you’ve been getting emails about how to look beyond retail and fast food openings* to jobs and internships that will help you build some professional skills. Go ahead and follow the links. If any of the advertised openings sound interesting to you, follow the instructions for applying to them. Has volunteering or community service been an important part of your life up to now? Look for ways to act on those values in college. The campus and local community offers a lot of ways to get involved, to create meaningful change, to explore your scope for leadership. Did you decide to major in English or Creative Writing because you are passionate about the written word? You’ll consume and create a lot of words in your courses, but campus also offers a lot of way to produce them: editing various publications (Re:Search, Montage, Daily Illini, buzz), assisting with open mic nights, getting involved with volunteer radio and TV efforts, joining theater groups, collaborating with others on events and projects. Creating, editing, and producing original content is valuable and relevant experience. You don’t need to do all of these things from day one! One or two alone can be the center of a meaningful college experience. The important thing is to give yourself opportunities outside the classroom to discover what you’re good at and what’s important to you. The better you understand yourself, the easier it will be to identify the career directions you want to pursue. *Of course, if you really enjoy customer service work, go ahead and do more of it! — but with purpose and direction. There are a lot of career options for people who who are good at connecting with others–particularly if you’re good enough at it to advance to a managerial role. **Quad Day can be overwhelming, but it will expose you to the vast range of clubs, organizations, and service that is available to you. Click here for our advice on how to cope with the abundance.